Here's the first "Photo of the Night" for the Time Machine 2011 tour, taken by John Arrowsmith (Rush pyro tech and photographer). I'll be posting at least one from each show. Click the photo to go to the entire set from Sunrise, FL. You can also purchase these photos. 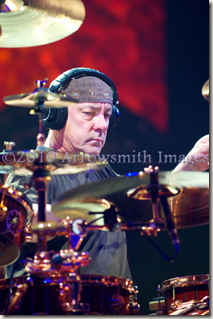 Looks like Neil's still wearing the headphones -- most likely to prevent the ear problems he experienced on the 2010 tour.